Newcomer Family Obituaries - Helen 'Jean' Wright 1924 - 2019 - Newcomer Cremations, Funerals & Receptions. 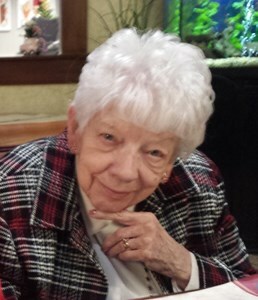 Helen "Jean" Wright, 94, passed away on April 8, 2019. She was born on June 25, 1924. She was preceded in death by her husband, George A., daughter, Pamela J. (Wayne) Campbell, parents, Russell H. and Clara E. Longstreth, siblings, James Longstreth, Joan Dawley, Larry Longstreth. Surviving family includes daughter, Becky (Randy) Glick, grandchildren, Tracey (Mike) Martin, Lindsey (Kenan) Jones, Jeremy (Ting Ting) Campbell, Jason Campbell, Kevin Campbell, Emily Campbell, Zack Campbell, Ashley Campbell, 9 great-grandchildren, brother, Alan Longstreth and many nieces, nephews and cousins. Visitation will be held from 11am to 12pm, Friday, April 12, 2019 at Newcomer, SW Chapel, 3393 Broadway, Grove City, OH, where a funeral service will begin at 12pm. Burial will follow at Sugar Grove Cemetery, Wilmington, OH. Add your memories to the guest book of Helen Wright. Jean was a lovely lady who passed her gift of wit on to her daughter Becky and her granddaughters as well! I met her in Ohio before Lindsey and Kenan (my son) married. I spent time with her for an evening and enjoyed hearing her comments and sharing her stories. Rest In Peace, Jean. Sorry for your loss. Your mom was a very sweet lady. I Am unable to come to visitation but my prayers are with you. Dear Dear Aunt Jean, such a lovely gentle lady. Such a quick, dry humored take on life as it unfolded for her family, friends and her beloved George. Truly an elegant Lady of Americas Greatest Generation. She will be missed but we are delighted our Aunt Jean is refreshed with the company of her mother Clara and father Russ, Cousin Pammy, our Uncle George, Aunt Jo, Uncle Larry and her big brother, our father Jim. All smiles, laughs and love from the Indiana Longstreths- Susie, Gayle, Anne, Jimmy, Ricky and Patti.